Björn Wenninger studied in Karlsruhe and Barcelona and holds a diploma in Industrial Engineering and Management from the Karlsruhe Institute of Technology (KIT). After internships in the logistics industry and strategy consulting, Björn started his career with Berg Lund & Company in 2011. Since joining BLC, Björn worked on numerous projects not only in the public sector but also in the financial services industry. Moreover, he contributed to several projects in the energy sector and the logistics industry. 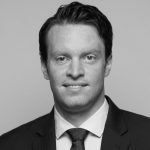 Besides his expertise on sales strategy and lending processes in corporate and consumer banking, Björn focusses – among others – on topics related to business development, corporate cooperations and IT strategy. Lately, Björn has begun to incorporate Design Thinking principles, processes and methods into his project work.